As you may have already been able to tell, I've really been enjoying Inika at the moment. I recently reviewed their Certified Organic BB Cream and I've also been testing a whole host of their products. Today I'm going to be talking about their All About Eyes gift set that includes both their bestselling Long Lash mascara* and the brand new Liquid Eyeliner*. You also receive a rather snazzy gift bag that is perfect for carrying round your everyday essentials. I'm a bit of a seasoned pro when it comes to liquid eyeliner and so I'm very picky about performance. 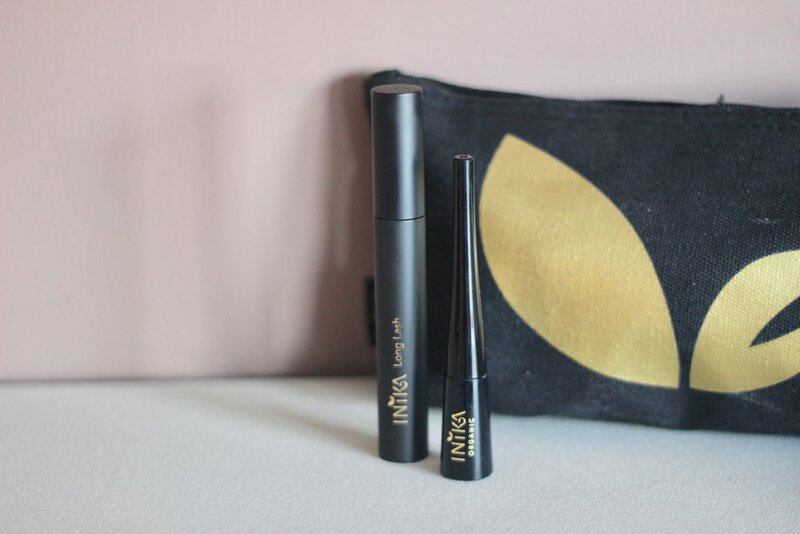 Having yet to find a natural liquid eyeliner that really ticks all the boxes, I was keen to give Inika's offering a whirl. I was intrigued by Inika's new liquid eyeliner mainly because of its packaging. Pre-natural/cruelty-free/vegan my liquid eyeliner of choice came in a very similar design. I found the long felt-tip nib extremely easy to use and I pretty much didn't stray until I learnt of the brand's dirty dealings in animal testing. Generally, I found the liner to be okay. In comparison to other natural liquid liners I have tried it goes on quite strongly upon first stroke. However, I did find - as shown above - that I had to keep dipping the nib back into the liquid as I found the product disappeared from the applicator super quickly. In addition to this, the nib is extremely hard and so product was easily moved around and almost even removed while you were trying to apply it. This also wasn't the most comfortable thing on my eye. Given the eyeliner's price, I would expect something a little more comfortable/easy to apply. Considering the fabulous quality of Inika's other products, I was a little disappointed by this. For now I have keeping to a non-natural (but still cruelty-free and vegan) alternative. Fortunately, the mascara more than enough made up for the liner's poor performance. I've fallen pretty much head over heels for the Inika Long Lash mascara. The matte packaging looks super luxe, the brush is perfect for easy application, and the formula is super long-lasting. I don't wear mascara that often but when I do, I instantly reach for this. I can trust it to make me look more awake, and make my eyelashes look lovely, luscious, and long. Despite its focus being on lengthening, it's also really black and decently volumising. Overall, I think this is a good set if you are wanting to give either the mascara, liner (or both) a go. Unfortunately I cannot see whether or not it is still available but you can get the mascara or liner seperately from LoveLula. If you've been in the green beauty community for any length of time then you will know how much those pesky North American bloggers talk about Zuzu Luxe. Previously unavailable in the UK, this well established vegan natural brand is particularly known for their mascara and liquid eyeliner. They're cult natural products. Well thank the green beauty gods; these two products are now available in the UK through Amazon! Obviously, I was quick to give them a try. And guess what? They're absolutely brilliant. 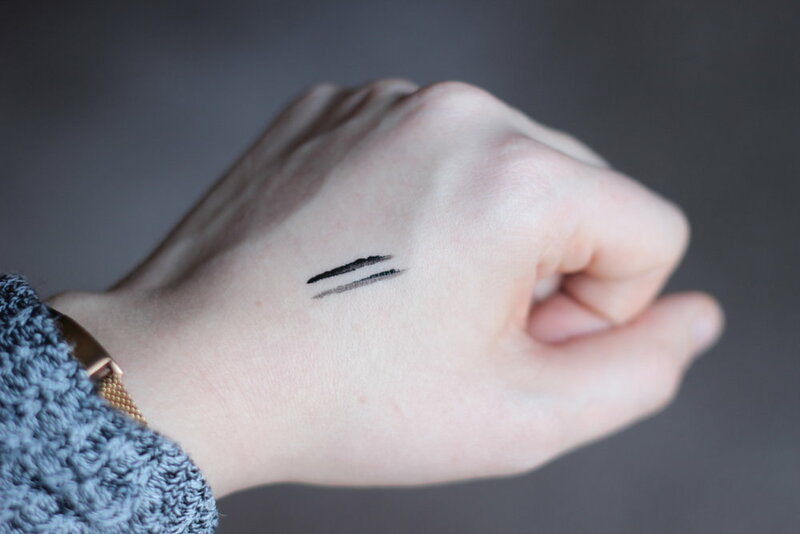 The Zuzu Luxe Mascara in Onyx has a very similar formula to PHB Ethical Beauty's mascara. However, with the move to Amazon, the Zuzu Luxe is easier to get hold of. In addition, the Zuzu Luxe doesn't contain the controversial ingredient that is phenoxyethanol; something that I usually choose to avoid. I don't think that the mascara smudges on me and this is really impressive considering how oily my eyelids can be. The formula is quite wet to apply but it's definitely manageable and once dry, doesn't seem to move at all. It is a tad pricey at £17 but - if you're not an immediate gratification person - you could definitely source it a little cheaper by using a website like Vitacost. Despite this, it's still cheaper than a lot of other vegan options (such as Ilia). The brown shade also seems to be available if that's more your jam. As much as I'm loving the mascara, the Zuzu Luxe Raven Liquid Eyeliner is without a doubt the stand-out product. Now, unfortunately the price for this one is still quite high (at about £19), but as someone who thrives on a cat-eye, it's definitely worth it as it performs miles better than the other vegan liquid eyeliner I've tried from The All Natural Face. The applicator is really similar to my previous non-natural favourite and so it's really easy for me to apply and the colour is strong and very black. Although the lasting power isn't exactly 12 hours, it's long-lasting enough for me and is also easy to remove with an oil cleanser. I'm not quite back to my daily eyeliner days, but I'm happy that I now have the option to rock a nostalgic cat-eye. Have you tried anything from Zuzu Luxe? Will you be giving the eyeliner and/or mascara a go now that it's available in the UK? This review has been a long-time coming. I've managed to keep the excitement under wraps but it has all got too much and I just need to tell you all about this mascara. We all know that the world of natural mascaras is both a minefield and generally full of disappointments. Personally, I've been pretty lucky so far - my first foray, the Ilia mascara, was a big hit and I loved it until the final drop. However, it's damn pricey and since then I've been looking for a cheaper replacement. This is where the new, reformulated Lily Lolo Mascara comes in. Similar in effect, it just ticks all the boxes where my previous love was lacking. Following the huge rebrand of Lily Lolo, a lot of their products were reworked and reformulated. This included the previously-so-so Lash Alert Mascara. I never got to try its predecessor, but the new formulation has caught my heart firmly in its grasp. This new formulation is truly a masterpiece - for me anyway. If you're a fan of huge voluminous lashes then this is possibly not for you. However, if you're like me and you like; a little volume; a deep black colour; fluttery separation; length and just general prettiness... you've got to try it. The website describes it as creating a 'doe-eyed look', and I would most definitely agree. It works wonderfully even with my slightly oily eyelids, being both smudge and flake-free. I wouldn't call it waterproof, but it doesn't seem to transfer or run, while still being super easy to remove at the end of the day. It's of course 100% vegan, which makes the formula (lacking in the usual beeswax), even more impressive in terms of staying power. In comparison to the Ilia mascara, the major difference is that Lily Lolo's formula is slightly drier, making application a whole lot cleaner. Also, at £10.99, it's a whole lot cheaper. Ingredients-wise, everything is pretty low-level (0-2) on Skin Deep, however it is worth noting that the preservative used is potassium sorbate, which some people can react to (it scores a 3 on SD). I personally, have noticed no reaction, and I have experienced absolutely no itchy eyes while using this product. Which is great, because that always seemed to be a side effect of mascara for me. Overall, I am super impressed with this product - and the price-point is just a happy addition to it's lovely formula (and gorgeous packaging!). I highly suggest that everyone gives it a go! EDIT: I am no longer choosing to buy from Lily Lolo due to their continued sale of products containing carmine and lanolin. I am now endeavouring to solely support brands that are 100% vegetarian.